The blue English bulldogs – stubborn and hardy, friendly and all-in-all funny – is one breed that any family will surely adore. It’s pretty easy to decide that you want to bring home one of our adorable canines, but now the question is – which one? 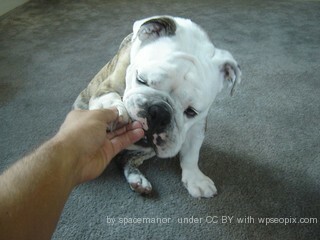 If you want a rare and beautiful bully to be part of your beloved family, then our English Bulldog is your best bet. Before you get excited and get any ideas of owning a canine the color of the sky, let’s talk about what makes a canine’s coat ‘blue’. This color in dogs is not an actual shade of blue like the ocean or your favorite crayon. True blue-coated dogs are actually a black canine with what they call a ‘dilution’ gene. A dilution gene, as the name suggests, dilutes the shade of the coat of the dog, making it seem muted or desaturated. For this canine to be truly blue, it has to be a black-coated English Bulldog, whose dilution gene causes its coat color to look lighter in shade. This lightened black coat gives the stale gray appearance that marks dogs as ‘true blue’. A true Blue English Bulldogs will have ‘self-colored’ noses and eyeliners, as well as paw pads, which means they will have the same color as their blue fur. However, for canines with a lighter blue shade, their nose, eyeliners and pads will have a darker blue color. A “Silver Blue Tri English Bulldog” has patches of lighter, silvery blue coat over the typical white body. The ‘tri’ characteristic comes from tan points on the eyebrows and legs. Their colors appear softer, with a silvery tinge on their blue coat, and a self-colored nose, eyeliners and paw pads. A “Blue Bi-Diluted English Bulldog” has a true slate-gray shade of this color, with no tan points like the “Blue Tri”. Their coats have a silvery sheen over their white bodies, giving them a striking contrast in their coats. The “Blue Brindle Tri” is a type of these canines that has a brindled blue coat. Brindle coats are finely-striped coats of two colors, and are very striking in the diluted blue shades available here. For your bulldog to keep its lovely rare sheen, proper care and maintenance of its short coat is important. When you buy your Bully puppy, make sure you have a good doggie shampoo ready. Choose one that has no strong chemicals that can strip your new canine’s coat of its natural moisture and shine, rendering it brittle and weak. Choose shampoos that have natural ingredients like oatmeal that can help keep your bulldog itch-free and flake-free. After giving it a bath, make sure to dry your big bully completely to keep it from getting yeast infections and such. Fleas and ticks can make your new best friend’s coat dull and damaged, so a monthly flea-and-tick control treatment can help prevent this. Coupled with some proper care, your bulldog will keep its rare and beautiful coat in tiptop shape for lots of fun and memorable years to come. At this site sometimes blue English bulldogs and puppies available.